Two alleged members of a gang that used women to lure victims before kidnapping them have been arrested, Mexican police say. The gang held the victims for ransom and in most cases killed them even after money had been paid, according to the authorities. The suspected leader and another member were arrested in the eastern town of Coatzacoalcos. Up to 12 kidnappings have been linked to the group. They operated by "using female members of the organisation to attract victims through social media and invite them to various locations," head of police investigations, Omar Garcia Harfuch told journalists. But when they arrived at the meeting place they would be abducted by one of the gang members, Mr Harfuch said. A woman arrested with the leader was alleged to be one of those who lured unsuspecting victims to locations where they were taken hostage. 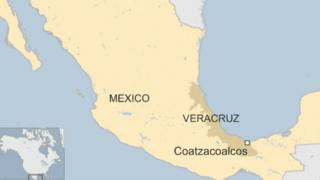 The state of Veracruz, where Coatzacoalcos is located, is noted for violent crimes relating to drugs and disappearances over the years. There were 867 reported kidnappings in Mexico between January and August, with 92 of them in Veracruz, according to government figure quoted by the AFP agency.